If you’re wondering where cast your reel to get on the fish you’ve come to the right place. In this article we will be covering everything from what’s biting during the different seasons, the best bait to use, where to find the fish and even most successful rods reels to target the fish. If you have a question or suggestion please feel free to comment below. 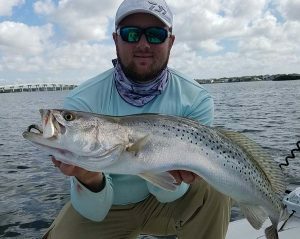 Clearwater Florida has an abundance of different fish species and several different ways to target them. We have Snook, Redfish Trout, Tarpon, King Mackerel, Spanish Mackerel, Pompano, Permit, Cobia, Black Drum, Gag Grouper, Mangrove Snapper, Hog Snapper and several different species of sharks. All these species can be caught within the shallow waters off the Clearwater beach area to Tarpon Springs as well as South to John’s Pass. 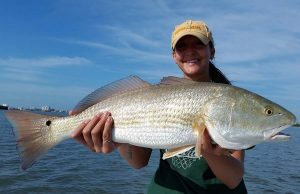 Redfish, Snook & Trout can all be targeted year round in the same areas whether it be on the open grass flats, along mangrove shorelines, spoil islands and rock jetties. Baits such as Scaled Sardines, Threadfin Herring, Ladyfish, Pinfish and Grass Grunts are the preferred baits for anglers. Most guides will rely heavily on live scaled sardines to chum the fish into a frenzy which can make for exciting fishing. This can also make for a short bite as the live bait will swim and the fish will follow them.. Then there are guides who like to do ‘chunk bait fishing’ with cut Ladyfish or pinfish. This style of fishing puts a lot of scent in the water and will hold fish in an area longer with multiple hookups and bite lasting longer. Whether it’s live bait or dead bait Redfish, Snook and Trout just can’t resist. Other popular techniques to target these species are artificial baits such as soft plastic jerkbaits, shad tail, swimbaits and topwater lures almost any hard or soft artificial bait. Redfish, Snook and Trout will tear these up on the flats and backwaters of Clearwater fl. 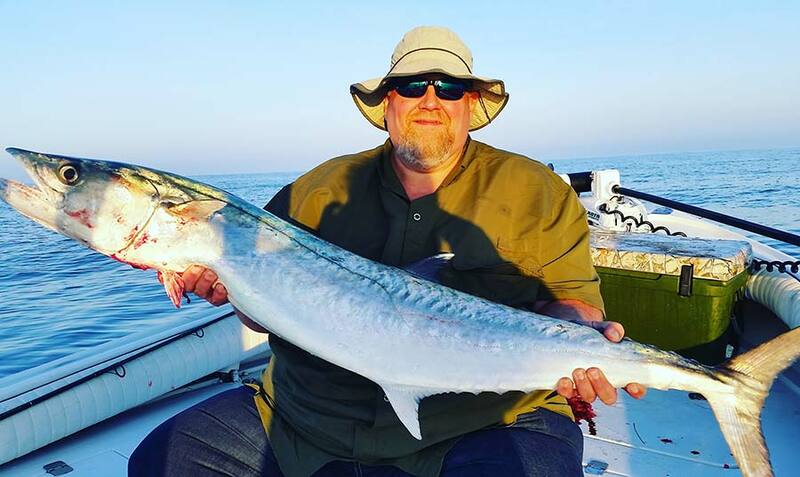 Migratory species such as King Mackerel, Spanish Mackerel and Cobia that show up in the fall and spring months from right off the beach to several miles offshore can produced rod screaming action. The most productive areas are shallow hard bottom reefs and artificial structures that line the west central beaches. I like to have several different baits for these species such as scaled sardines, shad, Ladyfish and blue runners. Having 2 live wells on a boat is almost a must as baits need to be separated. Most Charter captains or guides prefer live bait with light tackle. Some guides will anchor up and chum with live scaled sardines which can put the fish into a serious feeding frenzy. Charter guides often will fish up to 4 rods with a wire leader under a balloon set at various depths or treeline. This fishing technique can create an awesome experience. Other guides like myself (Capt. Craig Lahr) prefer slow trolling with bigger baits such as shad and lady fish that produce larger species such as kingfish on the hook. The normal rig is a 8-foot rod with a reel capable of holding up to 400 to 500 yards of line with a 10ft section 30 lb fluorocarbon leader attached to a 18in wire rig that consists of a 2 Watt tow hook and a number for Stinger treble hook in order to not get bit off by these tooth speedsters. Don’t be surprised if you hook several different sharks while fishing for these species. 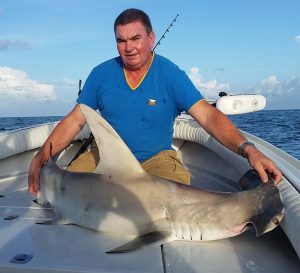 Sharks usually caught are black tips, spinners or bull sharks that are feeding on the mackerel and kingfish as well as the bait those species are feeding on. 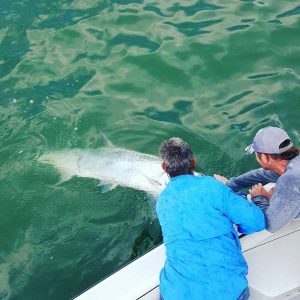 Tarpon and sharks are the next to show up in the late spring and through the entire summer. Tarpon can be found in several different areas from the beaches, passes backwaters and Tampa Bay. The prime months are May, June, July when you can find big schools of silver King migrating down the beaches. Most guides will follow these schools which gives you the opportunity for multiple shots. Best bait, rig & rod for hooking fish in late spring & summer. These fish species can be targeted several different ways but casting a live threadfin herring or pinfish under a cork is the norm. Standard tackle is an 8-foot medium heavy rod with a 6000 or 7,000 spinning reel with 40 to 60 lb braided line attached to a 4 to 8 foot 50 lb to 80 lb fluorocarbon leader with a 4 ot up to a 6ot J hook or circle hook. For the light tackle enthusiast plug fishing and fly fishing for tarpon is extremely popular in the Clearwater to Tarpon Springs area. 4 plug fisherman the ideal rod is an 8 ft fast heavy bait-casting style rod with a Shimano 700 Calcutta is what most guides use and their plugs of choice are mirror lower tpr’s and be away bait busters as well as some new lures like voodoo. Usually they will fish the big schools that are milling on the beach or even if they are not schooled up and are singles, doubles or triples well lead the fish and slowly work it by with a slow real. Next is fly fishing which Caladesiland, Honeymooniland, Three Rucker Bar and Anclote Key provide outstanding fly fishing for tarpon as it is pure white sand and you can see fish coming from a long distance. The ideal rod and fly reel setup would be a 12 weight with a #10 or #12 fly reel and an intermediate fly line the most popular flies are the tarpon toad in black and purple chartreuse and yellow but we’ve also caught them on Old School Tarpon flies as well as the glassy Bait fish patterns having several colors and patterns can make all the difference. Sharks become abundant in the summertime as many different species including bull sharks, black tips, spinner sharks, hammerheads, Atlantic spear nose and nurse sharks are all over the beaches prowling looking for food. They are not shy to eat anything you put out. Rods usually consists of a 8 foot heavy 52 80 lb class rod with a penn 6ot or 90t. Loaded with 50lb mono leader consist of 10 foot of stainless 500 lb cable with double 12s circle hooks and bigger baits such as Bonita stingrays barracuda Etc to try to catch that giant shark of a lifetime. Then we’re back to fall where everything repeats itself to migrate back through the Clearwater Florida area. 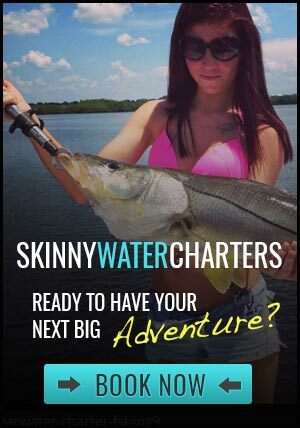 If you’re looking for an amazing fishing experience on our beautiful central west Florida waterways book the adventure today with Skinny Water Charters!